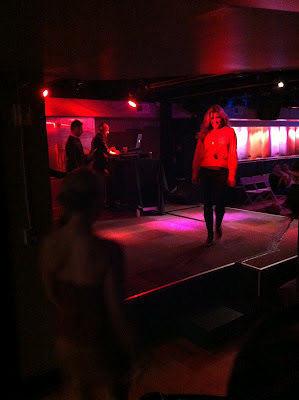 I was asked to be part of the Knoxville Scarecrow Foundation's Fashion Show at Latitude 35 last week. The funds raised go to benefit the Love Kitchen which feeds people who cannot feed their families for one reason or another. WVLT's Dino Cartwright announced the models which included ladies from Channel 8 and Channel 10 as well as some men from different industries in town such as radio. Beth Haynes and Kristen Budden (below) anchor at WBIR-TV. Everyone was a little nervous lining up and we knew we were going to have to move quickly because the show only lasted 30 minutes and we each had two outfits to show. 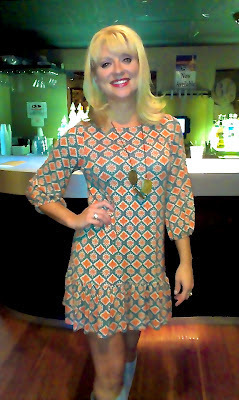 I like this dress (looks so 70s) from Crass Couture and paired it with my own light-colored suede boots. The event was fun - although I haven't been a part of anything like this for at least a year (I'm a student and teacher now) but was happy to help out a friend and a good cause.